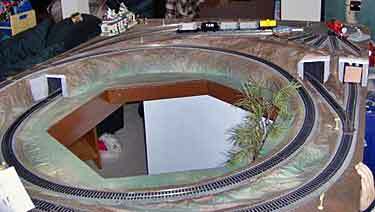 One of the oldest traditions in model railroading is the circular layout under the tree at the holiday season. 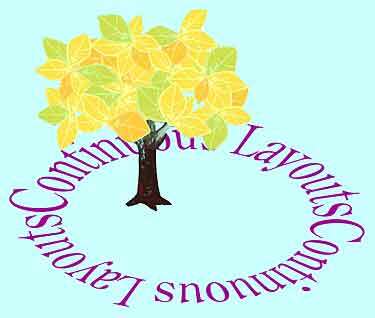 So this month is an appropriate time to consider what’s happening with oval layouts these days … and the answer is: quite a lot! 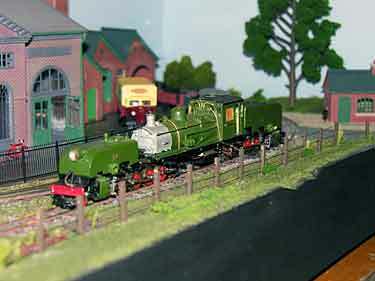 From very striking landscapes to well-operating railways in miniature, the circulating layout continues to provide its fair share of hobby fun. So here’s to going around in circles! And here, on this page, are gathered an amazing variety of examples of the delightful work currently being done “continuously” around the world, as it were. 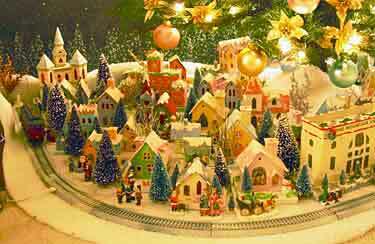 TRAINS AND HOLIDAY DISPLAYS ARE MADE FOR EACH OTHER! 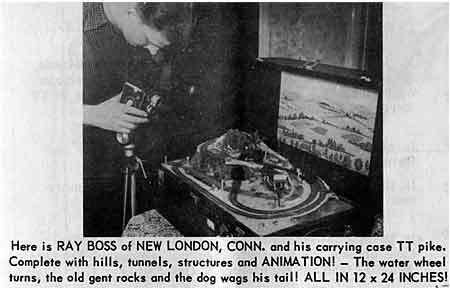 Howard Leroy Lamey, from Jacksonville, Florida USA, builds what he calls “glitter houses” — the style of cardboard structure models that bedecked mantelpieces 50 for more years ago and that accompanied many an early train layout under the holiday tree (see Scrapbook #67 for some closeup examples of Howard’s work). HERE’S AN OVAL DISGUISED AS A SHELF LINE! 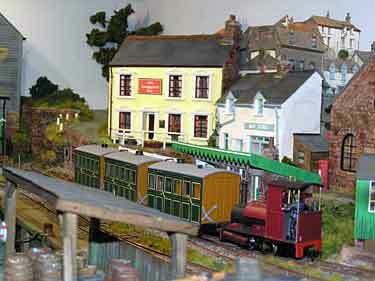 A much-admired layout on the English exhibition scene is Crackington Quay, built by Roy Parkes. It’s O-16.5/On30 (7mm scale running on 16.5mm track), and it won the David Lloyd Memorial Trophy at ExpoNG 2007, where Steve Fulljames shot the delightful panorama above, and more. The line supposedly comes in from the left and terminates at this station, except for a continuing branch to the quarry that exits to the right. So the plan earns its right to a hidden oval connection! As of this writing, Roy informs me that he has retired the layout from the exhibition circuit. John Angell, from the U.K., sent me the track design at the left below — a “micro” layout designed for large scale trains! John explains, “I have just been sketching a starter layout for a newbie in garden railroading. The layout has just two points [turnouts]! 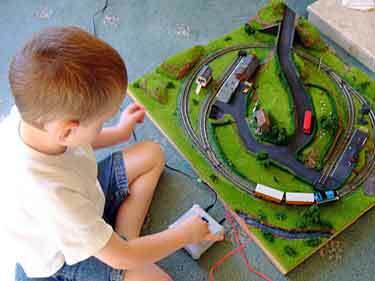 The operator is supposed to be in the centre of the garden, so the layout seems bigger than it is because you have to turn right round to watch the trains, or alternatively, allow the trains to pass out of sight behind you. “There’s a continuous run for steam locos, a branch line, and scope for shunting [switching]. What’s more, shunting can take place while a loco trundles round the outer circuit.” This arrangement allows quite a lot of operation using very simple means! 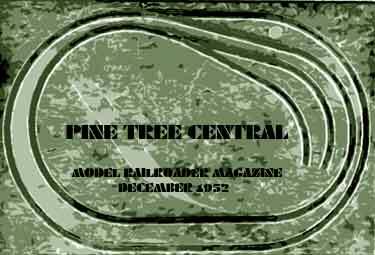 To show how a good track plan can resonate for many years, I have also included (below, right) a sketch of Model Railroader magazine’s very first project railroad layout published way back in 1952! Coincidentally, they picked the identical plan for their 4x6ft HO line because it offers so much railroading with a relatively small investment of time and money. Good ideas in track planning tend to stay around, and this oval plan has proved itself for more than half a century! 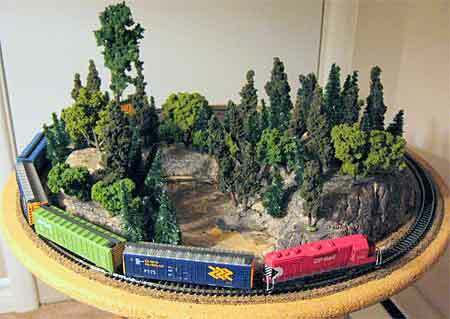 Michael-John Idzerda, from Toronto, Canada, is a long-time N scale devotee who decided to work larger for his latest layout. Using an existing 3x5ft baseboard and some Lionel trains he and his father had bought in the 1970s, M-J built the layout you see here. 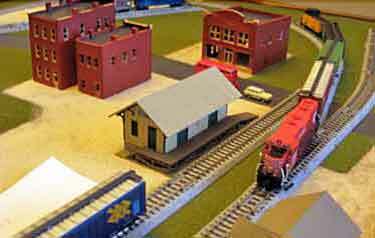 Clearly, with ingenuity you can put an enormous lot of trackage in a very small space! In O scale yet! The plan features an O27 oval with four sidings for switching — three facing the same direction and one contrary spur facing in the other direction, just to keep it interesting. 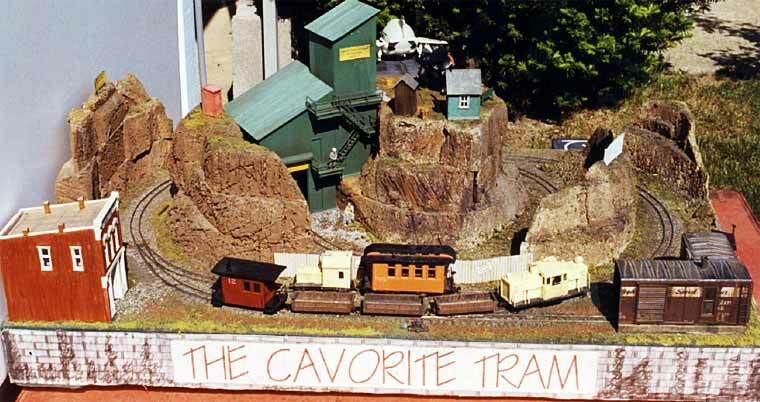 I particularly like the crossed spurs at the front of the layout. M-J has also squeezed in an overhead push-pull line that will eventually be used by a Lionel trolley car. Finally, why a 3x5ft footprint? M-J is a pipe organ technician by trade, and the board came from a church organ he was repairing near Toronto. It was the mounting box for a “harp stop,” a series of tuned metal bars inside the organ that are struck by padded hammers to give a special percussive effect. This particular harp stop mechanism was reinstalled inside the organ, and its former mounting board was spirited away for other inspirational uses! The remaining harp stop bars, before reinstallation, are shown at the lower right. 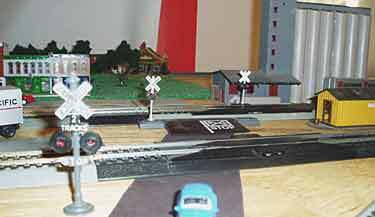 Model rails will make use of any materials they can find! 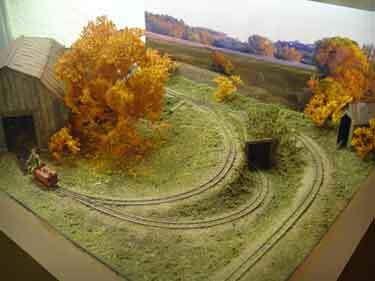 Railroad model layouts tend to go through lots of changes during construction, but normally only the builder knows about it, and what we see is the final result. Russ Haigh, a frequent contributor to these pages who lives in Willoughby, Ohio USA, provided “before” and “after” photos of his current layout project, Rattlesnake Hollow, an On30/On18 line built on an old 19½x28½in [50x72cm] baseboard frame. 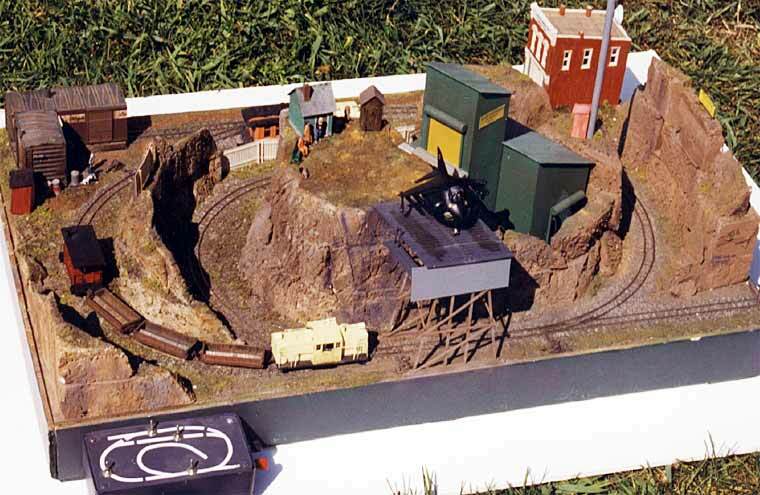 In the Before stage, Russ described the layout as “a loop of On30 [16.5mm gauge] on the lower level with hidden staging and a visible ore tipple fed by a loop of On18 [9mm gauge] above it.” Two months later the same baseboard looked like the After shot. “Rattlesnake Hollow is now mostly styrofoam and did lose some weight,” reports Russ. 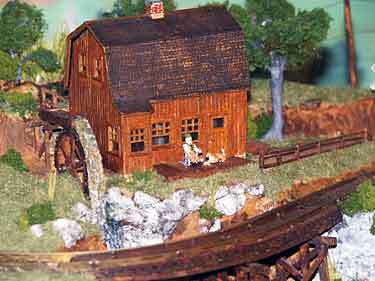 He also sent a shot of the upper level featuring a Beyer-Garret style locomotive. I can hardly wait to see what comes next! MANY A MICRO MAKS A MUCKLE O’ MODELS! Setting a new site record for Most Layouts Shown in One Scrapbook Issue is James McMillin, from Saint John, New Brunswick Canada. 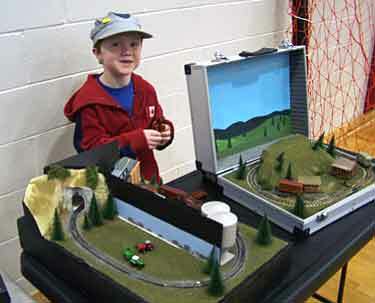 He recently exhibited four layouts at a Saint John train show, and all of them are continuous circuits and are pictured here! James’s son, Shamus (above left) is showing off two layouts. Topdown Shortline is an Hon30 loop line built in a metal briefcase and featured in Scrapbook #49. 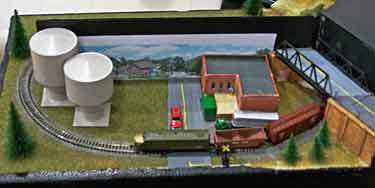 The other layout is a small N-scale loop built on a scrap piece of styrofoam packaging. The backdrop is made from corrugated plastic and divides the layout into two sections — the other half is shown in the picture at lower left. Bertram Kauert, from Berlin, Germany, built this delightful little H0e/HOn30 gravel-mine layout in a purpose-built case of 12mm (½in) plywood. The foam baseboard measures 79x35cm [31x14in] and “can easily be removed from the case so I can use the case for another micro layout to be built sometime in the future.” Planning ahead! The basic landscape is shaped from foam pieces, covered with a mixture of diluted PVA glue and sand from the Baltic Sea shore, which also is used for ballast. 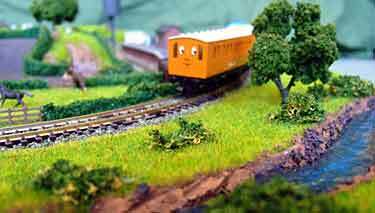 Bertram explains, “The tracks form an oval with a short unloading track and another short track to the old maintainance shop. The oval disappears on the left side behind a hill. Trains can be stopped before they appear again on the right side from behind the trees.” Bertram’s use of natural features (like a large puddle), model equipment, vehicles and human figures demonstrates how effective small details can be on a micro layout — there’s certainly a lot to look at here! 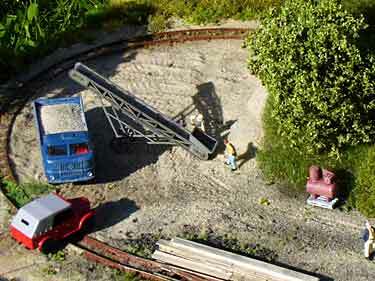 Often modeling problems can generate very creative solutions, and that is certainly the case with this N scale layout, Franzbourg, built by Francesco Zezza, from Rome, Italy. Lack of space was the problem. 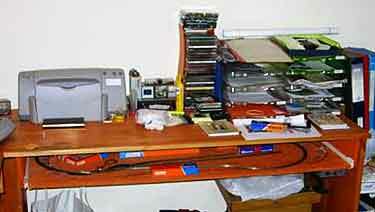 Francesco’s solution was a homemade pullout drawer under his desk, constructed like a computer keyboard tray. 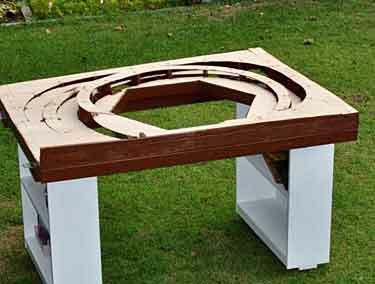 The layout simply pulls out for operating or for modeling, and slides back out of the way when it’s not in use. Landscaping represents the small town of Franzbourg, named after Francesco’s nickname and selected in order to sound German … the trains are German N scale, and the scenery is intended to look like “somewhere in Germany on a sunny morning in early spring.” The closeup (lower right) shows the quality of N scale modeling in this little layout. Francesco also adds his sincere thanks for their important help to the Italian Railway Model Association (AMICI scala N) and to all members of the discussion-board Forum ASN. The ancient clipping (above left) is from an HP Products TT catalog in the mid-1950’s. 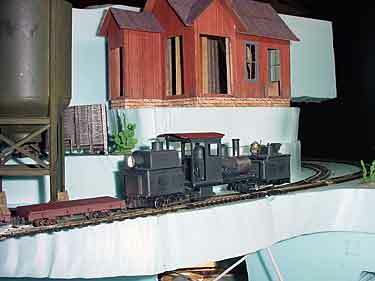 Ray Boss (right), who made this micro layout in 1953, is now living in Waterford, Connecticut USA and is still an active modeler (he just turned 80). 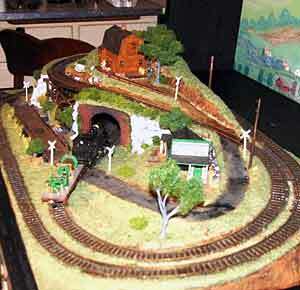 He recently dug out his old, original TT layout and refurbished it (dyed green sawdust turns ugly after 50 years). The result (above right) looks great and operates well! 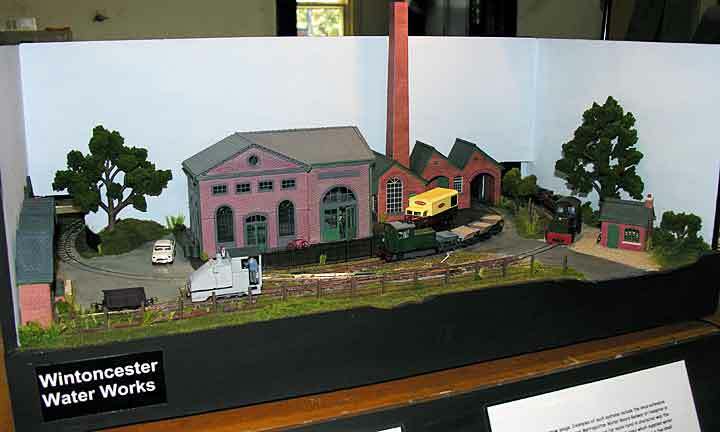 “This layout is perhaps one of the first (micro type) layouts which was widely publicized in the model press, and the selective compression of structures and scenery is a lesson to modelers in any scale. I know it piqued my interest in TT way back when.” Many thanks for the glad tidings, Jerry! 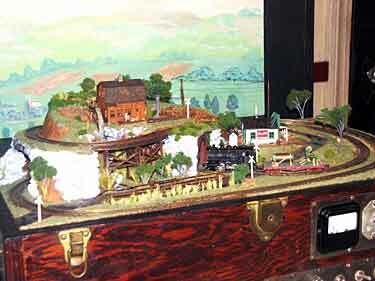 Brian Ratliff, from Bellevue, Nebraska USA, is building this 51x28in [130x71cm] HO layout, Euclid Railway, set between the delta and hill country region of Mississippi. There are more details and animation to add, like a flashing grade crossing and campfires for the campground. Brian is also adding a 36x8in [90x20cm] addition from the interchange track at the rear left to improve operations. His inspiration was pizza layouts on this site! 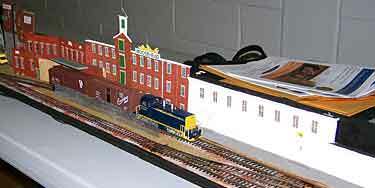 Casey Sterbenz, from Crofton, Maryland USA, is a long-time O-scale modeler (and charter member of the O Scale Kings). 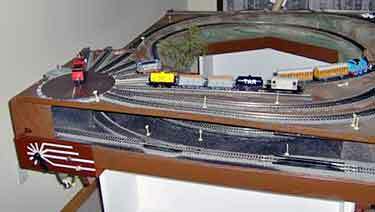 Recently he built a 4x5ft HO layout for his grandson, with remarkable results. Casey started with the track plan for Stockton & Darlington RR, which is Plan No. 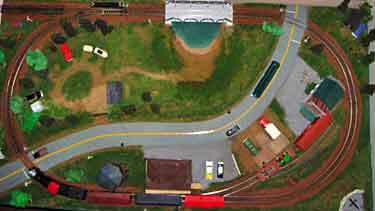 1 in Linn Westcott’s classic book, 101 Track Plans for Model Railroaders (Kalmbach). The most significant thing that Casey did to the plan, besides enlarging it somewhat to handle 18-inch radius curves, was to swap the low- and high-level trackage. This made possible a two-track yard and turntable at one end. Chris Cotton, from Southport, England, built this nice 26x22in [66x56cm] N-scale micro layout starring Thomas the Tank Engine for his son, whose name is – what else? – Thomas (above left). He’s four years old. 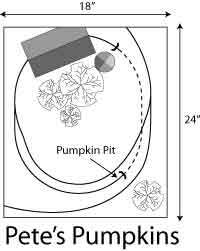 The track plan is a simple oval with two spurs inside it. 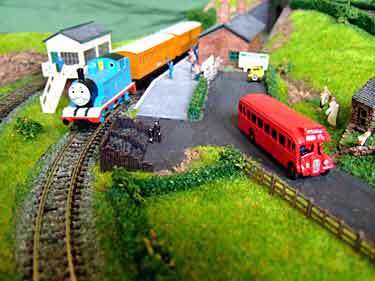 Bertie (a red bus) is a P&D Marsh model, with Bertie’s face added from a home made transfer. Thomas (the locomotive), shown under operation by Thomas (a boy) is by Tomix (a manufacturer) from Japan, and no doubt the layout is operated while eating Thomas (a food company) English Muffins! 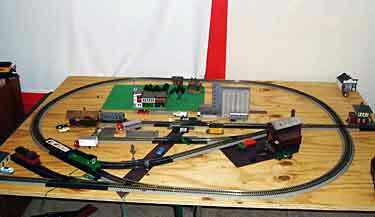 American Thad Carter is building this 65x45in [165x114cm] HO layout. The track plan is a main-line oval and a branch leading to the town of Hayes with its small yard. Note that the switching lead (head shunt) crosses the main at grade, which should create some interesting operating snags! Thad’s just beginning on the scenery phase of construction, and he’s experimenting with the use of N-scale buildings to lend a sense of distance. It’s too early to tell how this will all work out, but an early version is shown below at the right. Fred Stephenson, from Overland Park, Kansas USA, is a retired professional architect whose primary modeling enthusiasm leans towards creating structures. 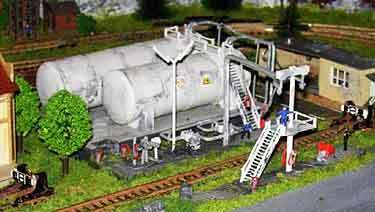 His 3x6ft layout is built to Sn42 scale — 1:64 scale on 16.5mm gauge. 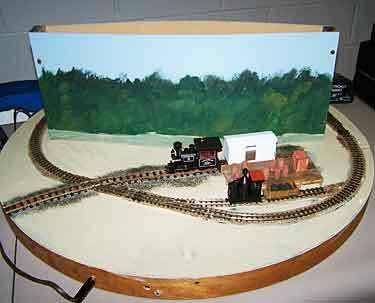 The track plan is a basic oval with spurs and a passing siding (loop) hidden at the rear for fiddling. 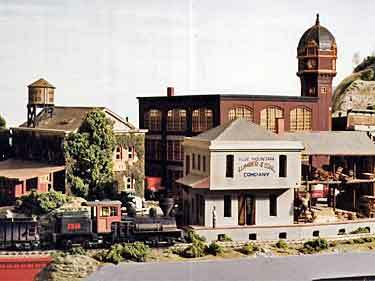 But Fred’s main focus is the structures, which are mostly scratchbuilt models of actual buildings in his home town of Chelsea, Michigan USA, on the former Michigan Central Railroad. The most recognizable landmark is the clock tower, which is a dominant feature in two of these photographs and an historical center of attention in Chelsea. 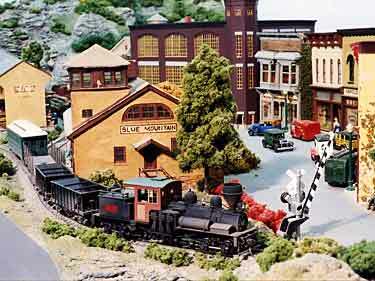 Judging from the visible vehicles, Fred’s layout is set sometime in the 1920s.